This newest granola recipe has a flavour profile similar to Pineapple Almond Muffins, which have proven very popular recently. Both the granola and the muffins are also wheat free (and gluten free depending on the purity of your oats). Pouring almond milk over a bowl of granola in the morning or as an afternoon snack is delicious way to get energized. Granola also can serve as dessert, which is a relief to have when everyone else is downing ice cream that is off limits for me. As one of my favourite snack options, and having a stash of granola options in the pantry helps me stay contentedly dairy free. As a gift, granola works for anyone, since they can pour on whatever milk they keep on hand, or use it as a yogurt topping. Feel free to boost the fruit quotient by adding in some dried mango or pineapple bits. And if you like to get together with friends to make holiday gifts, why not try a granola swap? Like a cookie swap, each person can bring a giant batch of one kind of granola and then divide it among the group so that everyone takes home an assortment to give–or keep and enjoy! In a large mixing bowl, whisk together oats, spices, and salt. In a separate bowl or in a blender jar, blend together brown sugar, pineapple puree, oil, maple syrup, and almond extract. Add wet mixture to oat mixture, and stir together until oats are evenly moistened. 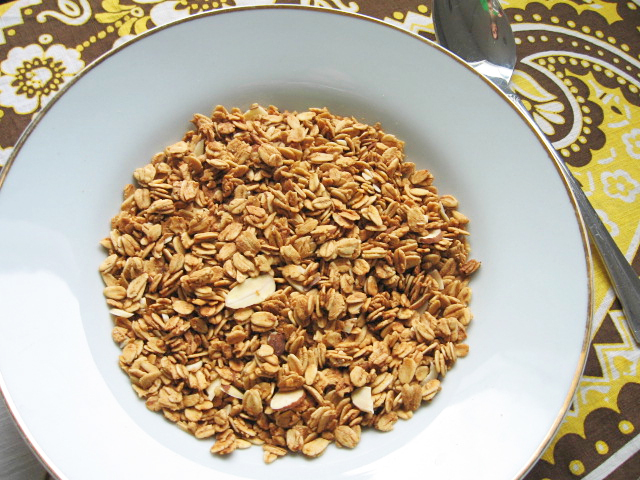 Spread granola onto a large parchment-lined baking tray (or baking stone). Divide into batches if necessary. Bake each batch for about 20 minutes at 325 degrees F (160 C). Stir granola. Add almonds and bake for 15 minutes more, until toasted but not too dark. Remove from oven and stir again. Allow granola to cool completely on the tray. Top with dried fruit if desired. Store cooled granola in mason jars or other sealed container, or pour into plastic bags for gifting and close with twist ties. I’m sharing this recipe at Marvelous Mondays and here. I seem to always “like” your posts which incorporate pineapple. Which is weird, because I almost never eat any. I must have some subconscious pineapple longing going on . . . The flavour is subtle in this one. Enjoy! Oh my goodness, this and the other granola recipes you list here sound amazing. Preparing to pin! This looks incredible!!! I eat pineapple everyday…seriously, we currently have 3 costco sized boxes of pineapple in our fridge! I HAVE to try it in granola! Yes, yes you do. I finished off my batch today. Stay tuned for another fruity granola recipe coming soon! Thanks! The pineapple flavour comes out more when it is combined with (almond) milk. Enjoy! I make my own granola, as well. 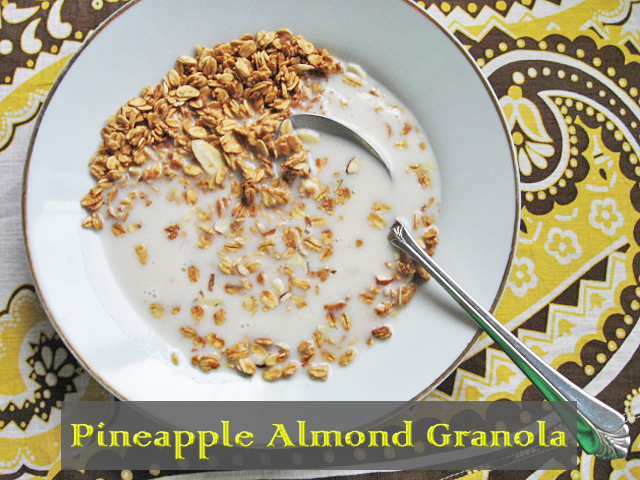 I love how versatile granola is, and pineapple almond sounds amazing! Thanks for linking up at Saturday Dishes- we will soon be the hosts, and we hope you’ll keep coming back!